FIELD TRIPS: Field trips are by far the most popular and most frequently used way for groups to visit Papa’s. In fact, we’ll welcome over 8,000 children (mostly students) for class trips in the fall so please plan early! We schedule field trips Monday through Friday from 9 am – 3 pm on the half hour (the only exception is that we are closed Monday mornings). The cost for the 90-minute trip is $1/person. It includes a train ride and orientation to the pumpkin patch, a small pumpkin (already bagged for each person and ready to go when you are) and one of Papa’s seriously famous pumpkin cookies for each group member. 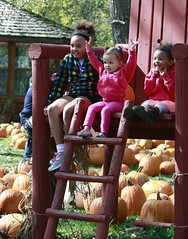 SCHEDULING: To schedule your field trip, email Mary Jane at groups@papaspumpkinpatch.com. Please include the following information with your request: your name, your email, your phone, group name, number of adults or chaperones with the group, number of students or children in the group, age of students or children, requested date, requested time and any special needs. 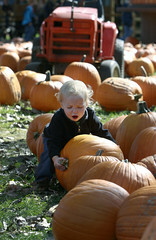 PARTIES AT PAPA’S: A sure winner for a party location everyone loves is Papa’s Pumpkin Patch! We offer covered outdoor picnic areas for groups from 10-100 guests. Parties are scheduled Monday through Friday between 4-7 pm and Saturdays and Sundays at 12:30 pm and 3:30 pm. The reservation fee is $25 for an outdoor shelter (covered roof and wooden picnic tables) and $50 for a covered outdoor shelter that also has three sides enclosed and is larger. The reservation fee must be paid in advance for Papa’s to hold your reservation. This includes a two-hour time slot for your party area, Papa’s famous pumpkin cookies for each person in your group and free admission for the “person of honor.” You may bring your own food and beverage at no charge. Papa’s has concessions if you prefer. Except for the celebrated guest, each party guest will need to pay admission ($5/person except on Thursdays, then $1/person; infants and toddlers age two and younger are free). You can choose to have each guest pay their own admission or you can buy admission tickets in advance and provide them to each of your guests so they are admitted without paying themselves. You can also buy activity tickets for your guests to use if you schedule your party on Thursday evenings or Saturday or Sunday when Papa has extra activities where there is a small fee (i.e. 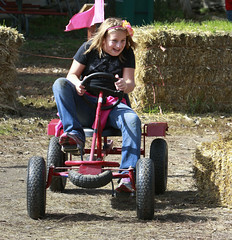 zip lines, pony rides, hay rides, train rides, pedal carts, corn cob sling shots and side-by-side Obstacle Course). You can buy activity tickets when you pay your reservation fee or when you arrive for your party. 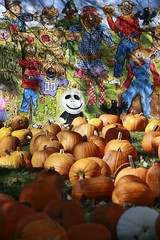 SCHEDULING: To schedule your party, email Aasta at groups@papaspumpkinpatch.com. Please include the following information with your request: your name, your email, your phone, name of the celebrated guest, number in the group, age of group members, requested date, requested time and any special needs. CORPORATE OR LARGE GROUP EVENTS: Businesses, associations and community groups know Papa’s is a unique fall location where everyone has a good time. From customer appreciation to family fun nights or church potlucks, Papa’s will work with you to plan the perfect event you have in mind. We normally schedule large group events (100+ guests) Monday through Friday between 4-7 pm. Papa’s does not hold a liquor license and we prefer non-alcoholic gatherings. SCHEDULING: Please contact Aasta at groups@papaspumpkinpatch.com or 701-400-4889 to discuss your large group event.